The 10 Most Unique Bars in Pennsylvania! It's no secret that Pennsylvanians like to have a good time. From Philly to the suburbs, there are a lot of options to choose from for a good drink, whether you're a lifelong resident or just passing through. Looking for something a bit more unique than the auld pub? From themed bars to historic sites to intriguing interiors and architecture, these 10 bars in Pennsylvania offer up unique experiences (and drinks) you won't soon forget. During prohibition, the Franklin Mortgage & Investment Company was a "front for America's largest alcohol running ring." It was opened in the late 1920s and, in the early days, the Franklin Mortgage & Investment Company saw more liquor run through its doors than Al Capone, according to the bar's website. 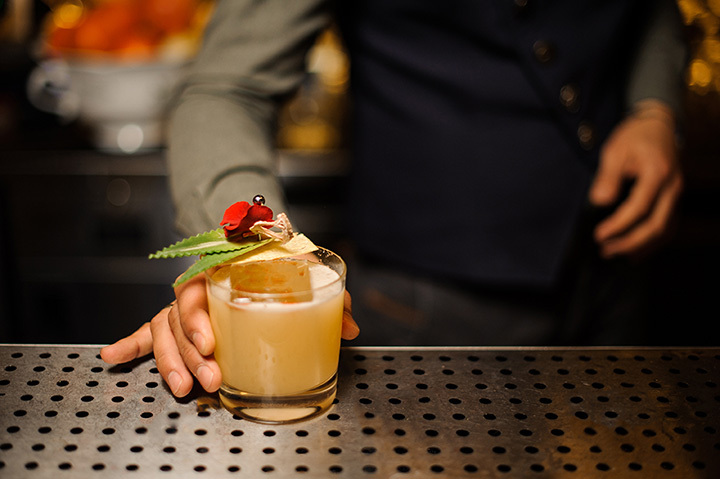 Now, the Franklin is a speakeasy-style bar complete with unmarked entrance, serving up craft cocktails that both pay homage to and elevate the classics. On the first floor, it's dimly lit, moody, and unpretentious—with delicious drinks always on deck, as expected. The second floor? It's got a tiki bar theme. Whether you're here for a good time, not a long time and head upstairs to the tiki bar, or you prefer the ambiance of the first floor—there's a drink with you in mind at the Franklin Bar. When you walk down the stairs and into the Bookstore Speakeasy, it feels as though you've stepped back in time. Just like Owen Wilson's character did in “Midnight in Paris.” You may not be in France, but you're definitely somewhere special. Grab a seat at the bar or a table and take a moment to admire your surroundings—from the vintage books to the dark wood and mood lighting. Peruse the menu—each is hidden in the inside of a book. Whether you choose a classic cocktail or something a bit more modern, you won't be disappointed at the Bookstore Speakeasy. Start your day off with one of the café drinks at Mixtape. Work on your latest screenplay, novel, or poem. As the hours scroll by and nighttime draws near, you might find yourself craving something a little stronger than caffeine. If you do, you're in luck, because Mixtape has you covered there, too...with a wide array of signature cocktails, shots, and shot + brew deals to quench your thirst. And on the off chance you're craving both alcohol and caffeine—you can order a spiked beverage from the café hot or iced—and they have vegan versions, too. Hang out at Mixtape, relax with a good drink, and listen to their mix. Weird things happen often on South Street. And at Tattooed Mom, weird things are practically a given. They're celebrated, in fact! From the interior décor which is covered in murals, graffiti, and stickers—to the drink specials which highlight fun ingredients like pop rocks and rock candy. There are some funky bar bites to pair with your choice of brew, too—from sandwiches, wraps, and tacos to waffle fries and topped tater tots. That's what's great about Tattooed Mom—their doors are open to anyone who decide to venture in, making it a truly unique spot that attracts all different types of people. And it's hard not to feel at home in a place like that. Maybe you're not religious, and your first taste of beer was as close to a religious experience as you've ever had. At the Church Brew Works in Pittsburgh, you can have both. A prayer and a pint! Or maybe just a pint. That's fine, too. McGillin's Olde Ale House is an Irish pub. And no, it's not just any Irish pub. What makes McGillin's so unique, you're probably wondering. It just so happens to be the oldest operating tavern in the city of Philadelphia. It was established in 1860. 1860! That's the same year that Abraham Lincoln became president. Looking for a historic pint after a trip to the liberty bell, or just something to wash your cheesesteak down with? Stop by McGillin's—everyone's welcome. Walk into Art in the Age of Mechanical Reproduction, and you'll be greeted by bitters, an array of barware, cocktail recipe books, and T-shirts. If you continue to the back of the shop, however, you'll find a craft cocktail bar tucked away. What makes the bar inside of Art in the Age unique is just that—its location—one that only locavores, craft cocktail connoisseurs, and the ultra-hip would know. But now you do, too. And the fact that they utilize the bar to showcase their exotic alcohol, of course. Chicory root vodka, anyone? The Garage is an auto garage inspired bar with two locations in Philly. There's the OG in Passayunk Square and the latest addition in Fishtown. No matter which location you're at, you'll always find "cold beers right heres." Over 400 cans—to be exact. And if a wide array of beers isn't enough to bring you in, there's whiskey and pickle backs, too. In addition to its unique décor and inspiration, both locations feature games like pool, skeeball, and pinball. But one of the biggest draws, apart from the beer selection, of course, are the featured chefs. Check out the events calendar on their website for information on who's cooking what and when. Trust us, you won't want to miss out! If you're a pinball wizard or vintage video game aficionado with a love of craft beer, Barcade is just the place for you. It's exactly what it sounds like—a bar, inside of an arcade. Or is it an arcade inside of a bar? Either way, we're about it. Do you wish every day was Halloween? Do you start planning your costume and decorations months in advance? Are old-time horror flicks your favorite thing to watch? If you've answered yes to any of the above, you'll feel right at home at Pittsburgh's Jekyll & Hyde bar. As you might have gathered, Jekyll & Hyde is a Halloween-themed bar—and not just during October, either—it looks like the inside of a haunted house year-round. Spooky cocktail creations and ghoulish decorations abound— making this an ideal destination for drinks if you can't get enough of Halloween. And what's more? You might even get a pair of vampire teeth with your drink. Mwahaha.